A visit to your local mechanic costs you time and money, especially when you could learn to pull that bottom bracket yourself. But even the most seasoned home mechanic will find the Park Tool book useful when there’s a $5k jewel dangling from the stand. 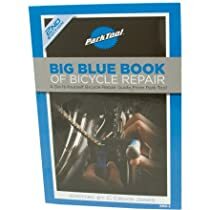 Compiled and updated yearly by the number-one bike-tool company in the world, the Big Blue Book contains step-by-step instructions for repairing everything from road to bmx bikes, whether you’re doing simple maintenance or a complete overhaul. Lots of photos allow your 6-year-old daughter to walk you through the most complicated of repairs, and as a result you’ll spend less money on six-packs for your local mechanic.